Conservationists working in Cameroon's Kagwene Gorilla Sanctuary have collected the first camera trap video footage of the Cross River gorilla. With fewer than 250 individuals remaining, Cross River gorillas are the world's rarest gorilla and a notoriously elusive species rarely observed directly by field researchers. Collected from one of four video camera traps set up by researchers in the protected area, the footage reveals eight Cross River gorillas casually making their way along a forest path. "This video gives us all a spectacular view into the hidden world of one of our closest relatives, which is in dire need of our help to survive," said Steve Sanderson, WCS President and CEO. Christopher Jameson, Director of WCS's Takamanda Mone Landscape Project, added: "The video represents the best images to date of Cross River gorillas, normally shy animals that flee at the slightest hint of human presence. The footage provides us with our first tantalizing glimpses of Cross River gorillas behaving normally in their environment. A person can study these animals for years and never even catch a glimpse of the gorillas, much less see anything like this." Running at almost two minutes in length, the video begins with the entry of one gorilla, which sits at the base of a tree while others emerge from the dense forest. At one point, a male silverback appears, surveying the area (and perhaps aware of the camera) before running past the camera lens giving a classic "chest-beating" display. Another gorilla (appearing in the footage at around 1:18 in the sequence) appears to be missing a hand, a healed injury but a disquieting indicator of the presence of snares within the family group's range in the past before increased patrolling in the now-protected area. "Cross River gorillas occur in very low densities across their entire range, so the appearance of a possible snare injury is a reminder that continued law enforcement efforts are needed to prevent further injuries to gorillas in the sanctuary," said Dr. Liz Macfie, Gorilla Coordinator for WCS's Species Program. The Kagwene Gorilla Sanctuary was established by the government of Cameroon in 2008 for the sole purpose of protecting the Cross River gorilla and evolved out of the "Gorilla Guardian" community network, created by WCS to improve gorilla survival prospects in the most vulnerable unprotected forest sites in Cameroon. The sanctuary is now managed by a conservator (chief warden) assisted by two ecoguards, all appointed by the Ministry of Forests and Wildlife (MINFOF), and a strong team of local staff from the eight villages near the protected area. Kagwene is the only site where daily monitoring of Cross River gorilla movements takes place. 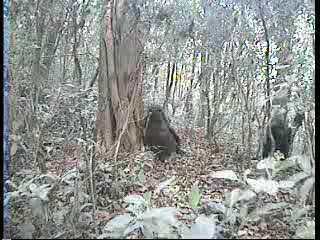 "Spectacular footage such as this, which we've never had before for Cross River gorillas, is absolutely vital to inspire local people, the governments of Nigeria and Cameroon, and the global community to care about and to save this unique subspecies," said Dr. James Deutsch, Executive Director for WCS's Africa Program. "Continued research of this kind will help fine-tune management plans to protect this rarest of apes." The Cross River gorilla is the rarest of the four subspecies of gorilla, with fewer than 250 individuals remaining across its entire range, limited to the remote forested mountainous terrain on the border region of Nigeria and Cameroon. The subspecies is listed as "Critically Endangered" and is threatened by both habitat destruction and hunting, as the entire population lives in a region of high human population density and heavy natural resource exploitation. Local community residents in the area surrounding Kagwene do not directly hunt Cross River gorillas due to traditional beliefs, but they do set snares for other forest animals, and these could occasionally injure gorillas.